What a beautiful photo !!! Typical though .. you give them the choice of several places .. and they all sleep together !! Unfortunately our Saffy doesn’t like Dax the long haired black and white coming close … she hisses at him and growls like distant thunder !!! I thought by now they would have been friends .. but no, they sleep apart ! Nice to see you all again … I hope you are having a good summer. Ours …is one long heatwave .. around 38-40º and a lot of humidity which is horrible, and unusual ! By the way .. your room looks lovely .. and I adore your blinds !! So fresh and airy looking !! I have a lot of windows here too (Not 12 though !!) .. but we have moved since we last spoke !! 😉 I just had some people in to the house today to measure up to make some .. and give me a price .. as I can’t see anything I like ‘off the shelf’ … I just hope they won’t be too expensive ! Here it is rainy and not so summery, but not too cold either 18-20° max day temperature… well, a typical Swedish summer! := We had two or three sunny warm days … I still hope for more! I wish we could borrow 5-7° of your temperature, it would be warmer for us, and cooler for you, better for everyone! Saffy was 5 this year, Dax is a little older but he was the late comer ! They are better with each other .. but don’t cuddle! The do chase sometimes .. and they do have a little fun ..so yes, I do hope they make friends one day ! One funny thing is … that when one cat is drinking from the running tap .. (you know how cats LOVE to do that !) .. the other one sometimes jumps up on the sink too .. and waits patiently just centimetres away .. and they don’t hiss or anything ! Cats! So beautiful and so weird ! Ours have their little rituals also, it is amazing to watch the whole cat group and their relations. I think animals complete our lives in the most wonderful ways. This photo reached the calm and the serenity, I love! Dear Jelena, just back from holiday. Your cats look like they have a lovely time. So have siamese Morris and Billy have had and are having in the summerhouse. On May 29 we had to say farewell to beautiful lovely Mimmi at the age of 17. Terrible for all of us but mostly for Morris who was is big shock for about 7 weeks. I was planning for a serious diet for him this summer , but he loost about 2 kg just since then, also he has just wanted to be around us (me). No mice haunting, very little birdwatching, not allowing Billy to be close at all. Now suddenly he is back to his regular rutins. Had to pick him down from a neibours big apple tree the other day. Interesting anyway, and not at all surprising, how strong feelings they share for each other. We were lucky enough not to lose a pride member yet (the kittens moved out, but that went fine, it was a sort of an expected thing, it seemed, and for the ones who stayed it was okay to stay, too). 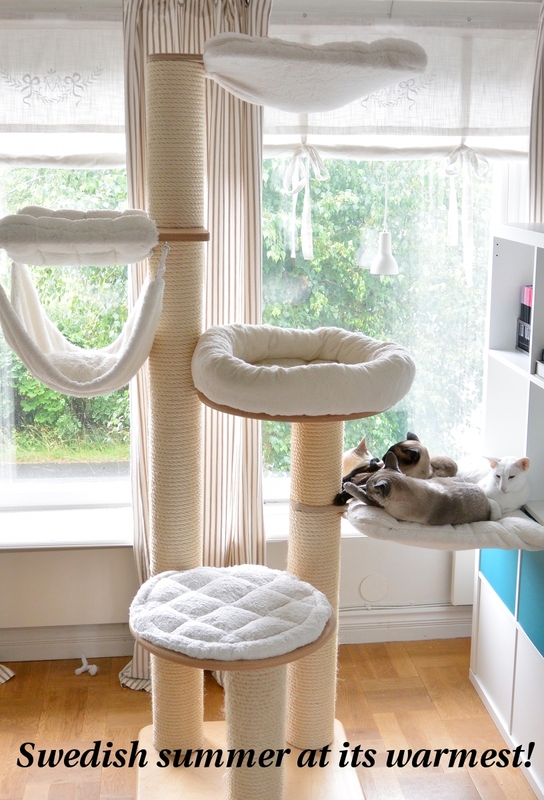 Like your cat tree, but so interesting your kits are sharing the same level.